Can we live on the moon? Can we travel to the future? Why is the sky blue? Questions we all ponder are answered in The World's Easiest Astronomy Book written by a former Aerospace Development Specialist turned high school teacher, Hitoshi Nakagawa. Hitoshi takes us through the difficult to understand subjects of space and the universe beyond with simple easy to understand language and amusing diagrams drawn in crayon. If you ever wanted to know how the universe worked but didn't know where to get started, this guide provides the answer. It goes beyond the assumptions of textbooks becoming a wonderfully pleasant read while teaching you something along the way. This informative, light, and entertaining book can be enjoyed at leisure anytime. 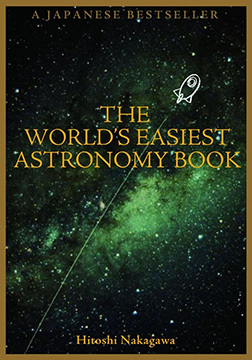 Discover the way of the universe through this delightful hand held guide. Released in Japan July 2006, this book has sold 53,000 copies. It has been featured in television programs and newspapers and sold 50,000 copies in the first two months of its release. For astronomy books, of which only 5,000 copies have ever been sold in Japan, it was an exceptional big hit in the category. This book has been named a best seller, ranking nineteenth place in the "most popular book" category at Kinokuniya, one of the major bookstores in Japan. However, the popularity of this book goes beyond Japan and has been gathering attention from NASA, as well as other establishments in the United States. It has also been recognized as highly reliable and commented on by neuroscientist, Kenichiro Mogi. A scientist regarded to be a future Nobel Prize candidate. Born in 1963, Kobe city, Hitoshi Nakagawa is a former officer of Japan's Aerospace Exploration Agency. Presently, he is a teacher of Osaka Sumiyoshi High School. He once worked for astronautic projects and publicity for manned space activities, however one day while telling space stories to children he made the decision to tell them to a great many more people.